Yorkshire is one of the proudest cricketing counties with a tremendous heritage and record. It’s a big county too as John Fuller’s All Wickets Great and Small shows as he writes, in most cases fondly, about grassroots clubs the length of the county. Some of the clubs visited have hosted county cricket such as Park Avenue, Bradford and Scarborough whilst others are of the more idyllic country setting. All those combine to not only show how much cricket is played in the county but also, in many cases, the diligence and commitment given by so many people. John Fuller, an author and freelance journalist who writes for The Cricketer and All Out Cricket, meets along the way many people from different cultures who all contribute to the running of twenty-three clubs. John investigates the many issues faced by clubs including the usual ones of finding a side, people to score, umpire and make teas and those who ensure that clubs survive and how they go about raising money. In most cases, the clubs appear to have been helpful to the author in bringing this engaging book together. Many of us who have played club cricket will recognise the commitment required, the inevitable squabbles but also the joy of it all most of the time. Titbits of information are included – how many of us knew that the founder of the world’s most famous ground, Lord’s, was born in Thirsk for example – whilst conversations with spectators show how fiercely they take it and how county appears to come before country. Leaving aside the cricket which, of course, is the main reason for the book, John Fuller’s opening page or two of each chapter is terrific entertainment. Going to the grounds by train and bus, yes, you’ve guessed that it wasn’t always plain sailing. John has a terrific sense of humour and a keen eye for the unusual and the everyday inconveniences which we have all met. It takes quite a bit to make me laugh at the end of the day but even more to do so at the beginning of the day but John, with his recollections of how he reached the grounds, has managed it so I am delighted to congratulate him upon it. 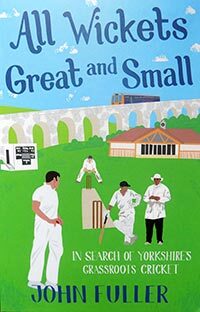 Read it and enjoy it, All Wickets Great and Small is a little gem.